Week of November 2: Our fall season went into extra innings this week as three teams advanced to finals and tournament play. But just like our home team, the New York Mets, the Panthers experienced both the thrill of victory and the agony of defeat within a few days. On Monday the Girls Varsity Volleyball Team lost to Saint Ann’s 3-1 (19-25, 20-25 25-22, 19-25) at St. Francis College in the ACIS Finals. On Tuesday the BFS Boys Varsity Soccer Team lost to Fieldston 4-1 at Randall’s Island in the NYSAIS Tournament, and the Girls Varsity Soccer Team lost to Poly Prep 5-1 at Poly Prep in the NYSAIS Tournament. The records speak for themselves and they are excellent. Boys Varsity Soccer, 13-5; Girls Varsity Soccer, 13-1; Middle School Boys Soccer, 10-1-1; Middle School Girls Soccer 3-4-4; Girls Varsity Volleyball, 14-4; Girls Junior Varsity Volleyball, 8-8; and Middle School Girls Volleyball 8-4. Week of October 26: Our fall season is winding down and it’s been a beauty. There were 9 wins, one tie and 2 tough losses this week. Varsity Girls Soccer (pictured below at right) were crowned ISAL champions, and championship honors also went to the Middle School Girls Volleyball and Boys Soccer teams. On Monday the Girls Varsity Volleyball Team defeated Steiner 3-0 (25-21, 25-15 25-12) in the upper gym, and The MS Boys Soccer Team tied St. Ann’s 3-3 down at beautiful Brooklyn Bridge Park. Tuesday was another winning day for soccer. The Boys Varsity Soccer Team defeated BWL 3-3 (5-4 on penalty kicks) in the ISAL Semifinals at Randall’s Island. The Girls Varsity Soccer Team defeated LREI 3-1 in the ISAL Semifinals at Randall’s Island.On Wednesday the Girls Varsity Volleyball Team defeated Dwight 3-0 (25-9, 25-12, 25-19) in the ISAL Semifinals at our upper gym. The BFS MS Girls Volleyball Team defeated Friends Seminary 2-0 (27-25, 25-19) on the road to close our their season. Congrats on a great season, ISAL League Champions. On Thursday the BFS Girls Varsity Soccer Team defeated Dwight 6-0 in the ISAL Finals at Calvert Vaux. We are the Champions! The MS Boys Soccer Team defeated Friends Seminary 4-0 down at Red Hook. Congrats on a great season, ISAL League Champions. The BFS MS Girls Soccer Team defeated Friends Seminary 2-0 down at Red Hook. Congrats on a fantastic season. The BFS Boys Varsity Soccer Team lost to York Prep 3-2 in overtime in the ISAL Finals down at Red Hook. On Friday the BFS Boys Varsity Varsity Soccer Team defeated Leman Prep 3-1 in the ACIS B Semifinals at Red Hook.The BFS Girls Varsity Volleyball Team lost to LREI 3-0 (18-25, 15-25, 19-25) in the ISAL Finals at the Dwight School Athletic Center. Week of October 19: An amazing 16 victories! On Monday the Girls Varsity Soccer Team defeated FASNY 7-0 on the road at Randall’s Island, and Boys Varsity Soccer defeated Leman Prep 3-1 at Red Hook.The MS Boys Soccer Team defeated Leman Prep 2-0 at Red Hook.The Girls Varsity Volleyball Team defeated Dwight 3-1 (26-24, 25-15, 24-26, 25-15) on the road. The Girls JV Volleyball Team also defeated Dwight 2-0 (25-18, 25-21) in the upper gym.The Boys & Girls Cross Country Team participated in a Meet at Van Cortlandt Park. On Tuesday the MS Girls Volleyball Team defeated York Prep 2-0 (25-14, 25-8) in the upper gym and Girls JV Volleyball Team defeated BWL 2-1 (18-25, 25-9, 25-19) in the upper gym. On Wednesday the MS Girls Soccer Team defeated Avenues 1-0 down at Red Hook, and the MS Girls Volleyball Team defeated Bay Ridge Prep 2-0 (25-23, 25-16) in the upper gym.The Girls JV Volleyball Team defeated LREI 2-0 (25-20, 25-17) in the upper gym. On Thursday, there were more wins in both volleyball and soccer. The Girls Varsity Volleyball Team defeated BWL 2-0 (25-16, 25-17, 25-20) in the upper gym. The Girls Varsity Soccer Team defeated LREI 5-0 down at Red Hook. The Boys Varsity Soccer Team defeated LREI 2-0 down at Red Hook.The MS Girls Soccer Team tied UNIS 2-2 on Randall’s Island. The Boys & Girls Varsity Cross Country Team participated in the ISAL Championship Meet at Van Cortlandt Park. On Friday the BFS Girls Varsity Volleyball Team defeated Leman Prep 2-0 (25-18, 25-22, 25-18) on the road. The BFS Girls JV Volleyball Team defeated Leman Prep 2-0 (25-15, 25-20) in the upper gym. Week of October 12: On Wednesday the Girls Varsity Soccer Team defeated Staten Island Academy 4-1 down at Red Hook. The MS Girls Volleyball Team defeated Rudolf Steiner 2-0 (25-21, 28-26) in the upper gym. The Girls Varsity Volleyball Team defeated Bay Ridge Prep 3-0 (25-11, 25-16, 25-17) on the road. The MS Girls Soccer Team tied LFNY 1-1 at Red Hook. On Thursday the Girls Varsity Soccer Team defeated Churchill 5-1 down at Red Hook. The Boys Varsity Soccer Team defeated Churchill 2-0. The MS Boys Soccer Team defeated Churchill 3-1 down at Red Hook. The MS Girls Soccer Team tied LFNY 1-1 on the road. The Boys & Girls Cross Country Team participated in a Meet at Van Cortlandt Park. On Friday the Boys Varsity Soccer Team defeated Rudolf Steiner 1-0 at beautiful Brooklyn Bridge Park. The Girls Varsity Volleyball Team defeated Churchill 3-0 (25-19, 25-17, 25-13) on the road. The BFS MS Boys Soccer Team defeated Rudolf Steiner 7-0 on the road. Blue Pride!! Week of October 5: On Monday both the BFS Girls JV Volleyball Team and Girls Varsity Volleyball Team defeated Staten Island Academy at home. The JV score was 2-1 (25-15, 17-25, 25-20) and the Varsity score was 3-0 (25-11, 25-11, 25-7). There were victories also for the BFS Girls Varsity Soccer Team, with a 9-2 win over Lawrence Woodmere Academy on the road, the BFS Boys Varsity Soccer Team, who defeated Mary McDowell 3-1 at Red Hook, and the BFS MS Boys Soccer Team, who had a 3-2 win over Packer at beautiful Brooklyn Bridge Park. On Wednesday the BFS Girls Varsity Volleyball Team defeated Garden 3-0 (25-12, 25-11, 25-11) on the road, and the BFS MS Girls Soccer Team tied UNIS 0-0 at Red Hook. Thursday brought three more victories to the Panthers, all against Birch Wathen Lenox (BWL) at Red Hook. The BFS Boys Varsity Soccer Team defeated BWL 2-1, the BFS Girls Varsity Soccer Team defeated BWL 4-0, and the BFS MS Boys Soccer Team scored a 7-1 victory over BWL. Also on Thursday, the BFS Boys & Girls Cross Country Team participated in a Meet at Van Cortlandt Park. Blue Pride!! Week of September 28: On Monday, the BFS MS Girls Volleyball Team defeated Dwight 2-0 (25-16, 25-15) on the road. The BFS Girls JV Volleyball Team also defeated Dwight 2-1 (19-25, 25-19, 27-25) in an exciting road match. And the BFS Girls Varsity Volleyball Team also defeated Dwight 3-0 (25-14, 25-11, 26-24) in the upper gym. The BFS MS Boys Soccer Team defeated Dwight 2-1 down at Red Hook. The BFS Boys Varsity Soccer Team defeated Bay Ridge Prep 6-2 on the road. And the BFS Girls Varsity Soccer Team also defeated Dwight 7-0 down at Red Hook. On Wednesday the BFS MS Girls Volleyball Team defeated Birch Wathen Lenox 2-0 (25-23, 26-24 in the upper gym. The BFS Girls JV Volleyball Team defeated Berkeley Carroll 2-0 (25-22, 26-24) on the road. And the BFS Girls Varsity Volleyball Team also defeated Berkeley Carroll 3-0 (26-24, 25-17, 25-15) at St. Francis College. The BFS MS Boys Soccer Team defeated Friends Seminary 6-2 down at Red Hook. The BFS MS Girls Soccer Team defeated Avenues 4-1 down at Red Hook as well. And the BFS Girls Varsity Soccer Team defeated Berkeley Carroll 4-2 at beautiful Brooklyn Bridge Park. On Thursday the BFS MS Boys Soccer Team defeated York Prep 6-0 down at Red Hook. The Boys Varsity Soccer Team defeated York Prep 5-3 also at Red Hook. And the Girls Varsity Soccer Team also defeated York Prep 8-0 down at Red Hook. 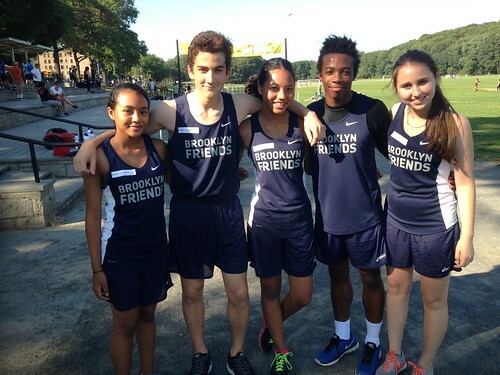 The BFS Boys & Girls Cross Country Team participated in a Meet at Van Cortlandt Park. Blue Pride!! Week of September 21: On Monday, the BFS Girls JV Volleyball Team defeated LREI 2-0 (25-20, 25-23) on the road, and the BFS Boys & Girls Cross Country Team participated in a Meet at Van Cortlandt Park. On Thursday, we had a “quadruple” winning day: The BFS MS Boys Soccer Team defeated Garden 7-1 down at Red Hook. The BFS MS Girls Volleyball Team defeated LREI 2-1 (27-25, 24-26, 15-10) on the road. The BFS Boys Varsity Soccer Team defeated Garden 4-1 down at Red Hook. And the BFS Girls Varsity Soccer Team defeated Friends Seminary 7-0, also at Red Hook. To finish the week off, on Friday the BFS MS Girls Volleyball Team defeated Berkeley Carroll 2-0 (25-15, 25-14) on the road. Blue Pride!! Week of September 14: On Thursday the BFS Boys Varsity Soccer Team defeated Staten Island Academy 2-1 down at Red Hook. The BFS Girls Varsity Volleyball Team defeated Friends Seminary 3-0 (25-21, 25-10, 25-11) on the road. The BFS Boys & Girls Cross Country Team participated in their first Meet of the season at Van Cortlandt Park. On Friday the BFS Girls Varsity Soccer Team defeated Grace Church 7-0 at beautiful Brooklyn Bridge Park. The BFS Boys Varsity Soccer Team defeated Leman Manhattan Prep 5-2 down at Red Hook. The BFS Girls Varsity Volleyball Team defeated York Prep 3-0 (25-8, 25-10, 25-18) on the road. Blue Pride! !